Adding creativity and fun to your community engagement practices. Reaching a Broad Spectrum of the Community. It also features the delightful 4 minute film; Engaging Community, Inspiration from the Columbia Basin that tells the story of powerful engagement in three unique communities. Smart Planning Facilitators presented to planning colleagues from around the province at the 2011 PIBC Annual Conference. The team delivered an interactive session that enabled the participants to hear from each other and discuss their opportunities and concerns, about the principle of integration – one of seven principles on which Integrated Community Sustainability Planning are based. The facilitators session used graphic recording to track the conversation and had a section where participants noted their ideas and added them to the drawing. Community-scale Energy and GHG Modelling Tools: North Vancouver from Smart Planning on Vimeo. The experiences of five local governments with community–scale energy and greenhouse gas modelling tools are profiled in the BC Climate Action Toolkit: toolkit.bc.ca/program/modelling. The series is presented by Smart Planning for Communities and the Province of BC. Each case study includes a written and webcast component. The written case study is a downloadable report that describes how the modelling tool was used to help set greenhouse gas reduction targets, policies and actions, and the webcasts are slide presentations narrated by participating local government staff and their consultants. Preview one of the webcast segments featuring the City of North Vancouver narrated by Emily Adin: Planner - North Vancouver, Caroline Jackson: North Vancouver Community Energy Manager, Alex Boston - HB Lanarc. Download the North Vancouver Case Study here. 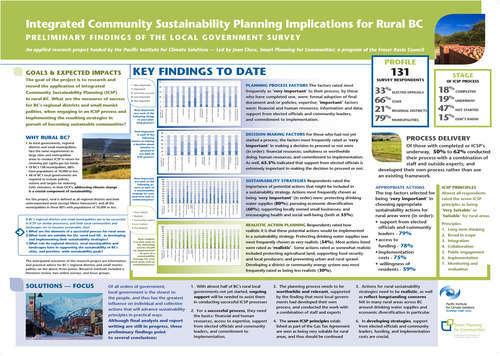 Case studies were also collected from the cities of Colwood, Prince George and more on North Vancouver, as well as the Central Kootenay and Fraser Valley regional districts to show how a variety of modelling tools work. The full series of case studies are available on The BC Climate Action Toolkit. This presentation was delivered on the Sunshine Coast of British Columbia in the Spring of 2011. It covers ways for local governments to approach community energy planning. This presentation discusses ways to manage community mobility. It features the Fraser Basin Council’s Transportation Demand Management (TDM) Guidebook for small to medium-sized communities and a case study prepared by the Climate Change and Air Quality team.